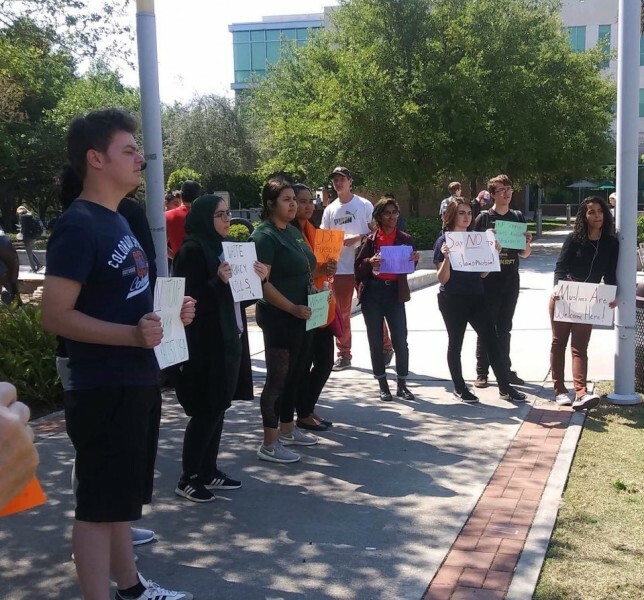 Tampa students hold vigil for victims of Christchurch mosque shootings | Fight Back! 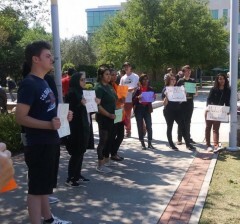 Tampa, FL - On March 21 University of South Florida (USF) students and Tampa community members gathered to commemorate the lives of the victims of the Christchurch New Zealand mosque shootings. Tampa Bay Students for a Democratic Society (SDS) hosted the event and laid out 50 flowers on the lawn in front of the Marshall Student Center to represent each victim of the attack. The shootings were committed by Brenton Tarrant. Tarrant was motivated by white-supremacist and alt-right ideas, such as xenophobia and anti-immigration, which he rambled about in a written statement. “The bottom line is that white supremacy and xenophobia exist here in the U.S. too, that’s why this vigil is important. Mosques are destroyed here, but few of these attacks are addressed by the media or the public, and justice is rarely served. We need to stand up and fight against these political issues before more attacks happen,” said Tampa Bay SDS member, Sanjukta Bhattacharjee. Tampa Bay SDS connected the event in New Zealand to the political situation in the United States, particularly at USF where there has been recent activity by white supremacist organizations like Patriot Front, along with racial slurs being spray-painted in campus dorms. “The work done to prevent white supremacist attacks in the U.S. is weak, especially under the Trump administration, so if we want these attacks to stop, the responsibility is ours to stomp white-supremacy out of our communities. The only way to start is through collective organizing, by showing white-supremacists and the government, alike, that we do not accept their conduct,” said Tampa Bay SDS member, Kareem Hessen. The event finished with the crowd chanting, “Islamaphobic, anti-gay, Patriot Front go away,” and SDS re-committing to the fight against white-supremacy on USF Tampa campus and in the U.S. government.